Cycle Chic®: Guest Photo: USA - "US Girls Ride, Too"
Guest Photo: USA - "US Girls Ride, Too"
This waltzed its way into our inbox with the subject reading, "US Girls Ride, Too". A wonderful photo from our good friend and photographer Derek Pearson in Olympia, Washington, USA. The photo features his wife and she, he tells us proudly, rides to work every day. A great photo, Derek, and thanks for sending it along to us. Great to see some quality Cycle Chic from your side of the pond. A cool bike, too. Check out Derek's bicycle site Bike Rubbish here. And be sure to check out his professional photographer site here. As soon as I saw this on Derek's site, I thought, "Somebody ought to send this to Cycle Chic." And somebody did. Huzzah! Yay, its so lovely to recognize those boats in the background! Though I've never seen her riding specifically, there are many excellent cyclists in the area. I <3 bikes in Olympia! I love the sassy boats in the background. 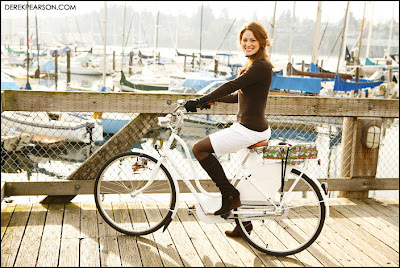 Where's the Seattle Cycle Chic blog?